Since 1989, the Dallas Bar Foundation has sponsored the William E. Collins Clerkship program for minority law students wanting to practice in Dallas. The clerkships were named in honor of William E. Collins, a long-time lawyer with Thompson & Knight, L.L.P. and Chairman of the Board of Trustees of the Dallas Bar Foundation from 1978 to 1982. The intent of the Collins Clerkships is to give minority students an opportunity for summer work experience, particularly if they have not been able to secure summer placements on their own. 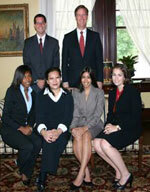 Minority students in their second year of law school are eligible to interview. The Collins Clerkship application must be submitted to the Dallas Bar Foundation with an official transcript and writing sample attached. Personal interviews are required. The interviews are usually held one day in March or early April. Applications are pre-screened to determine the students who will be interviewed on that day. The clerkships are for 6 weeks and are scheduled either the first half or second half of the summer. The Collins Clerks call and schedule their start and end dates with the designated Coordinator of the placements. The clerks are paid $550.00 a week. The Collins Clerk placed with the Supreme Court of Texas also receives a $1,000.00 housing allowance. The Collins Clerks are asked to report their work schedule to the Dallas Bar Foundation when confirmed and to report on their experience at the end of their placement.